Latin America in a Globalizing World (LAGW) is a three-year project, funded by a Dean’s Interdisciplinary Project Grant, which brings together scholars of Latin America with area specialists working on other regions to examine Latin America’s role in global economic processes, from both historical and contemporary perspectives. Recent years have seen renewed scholarly interest in the history of capitalism and in processes of development and globalization. While scholars of Latin America have long addressed questions of capitalism and development in the region, too often our perspective remains bounded within the Americas—as Latin Americanists, that is, we frequently find ourselves talking only to one another. LAGW seeks to break out of this geographic silo and to foster cross-disciplinary and cross-regional conversations among faculty. 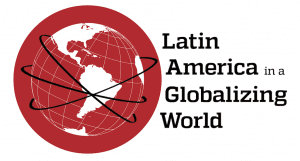 This program will also provide a means for the growing number of undergraduate and graduate students interested in Latin America to explore connections with other world regions. to foster connections across disciplines and schools within the university. Sign up for the LAGW mailing list. Schaffer Hall 303 at 4:00 p.m.
Mergenthaler Hall 526 at 12:00 p.m.
Gilman Hall 308 at 12:00 p.m.
Hodson Hall 311 at 12:00 p.m.
Gilman Hall 132 at 12:00 p.m.
Gilman Hall 479 at 5:30 p.m.
Mergenthaler Hall 426 at 12:00 p.m.
Levering Hall, Sherwood Room at 4:00 p.m.